Sunderland Empire is set to get all shook up next month when This is Elvis – Burbank and Vegas hits the stage for one week only, Monday 18 – Saturday 23 June 2018. THIS IS ELVIS – Burbank and Vegas celebrates 83 years since Elvis’ birth and marks 50 years since his televised ‘Special’ aired on NBC Television, which later came to be known as his ’68 Comeback Special. The musical follows the true story of this very pivotal period in Elvis’ life and career, charting his journey back to stardom and his return to success as a stage performer. It’s 1968 – the major musical event of the year was the first live TV special for Elvis Presley, drawing phenomenal ratings and almost half of the viewing audience. This event re-established Elvis as the major entertainment star of the decade, and twelve months later Elvis stars at the International Hotel in Vegas, performing live for the first time in seven years, securing his place in history as the King of Rock ‘n’ Roll! Direct from the USA, internationally renowned and award-winning tribute artist and actor STEVE MICHAELS will star as ‘The King’. STEVE MICHAELS has an incredible likeness to Elvis, from his outstanding voice, hair, side burns, piercing eyes and even his mannerisms have garnered him extraordinary global success. STEVE MICHAELS’ masterful performance and remarkable renditions of the King have garnered him worldwide attention. Steve has played alongside some of Elvis Presley’s iconic band mates including the legendary drummer DJ Fontana and bassist Jerry Scheff. In addition, he has shared the stage with the extraordinary Jordanaires and the soulful voices of the Sweet Inspirations. Steve’s exquisite styling and ability to successfully capture an authentic portrayal of Elvis Presley has endeared him to audiences everywhere across Canada, United States, India, Thailand, United Kingdom, Hong Kong, Philippines and Australia. THIS IS ELVIS recreates all the drama leading up to the comeback as well as staging the monumental concert. It then proceeds with The King to his Vegas debut. Featuring Elvis’s greatest hits including Trouble, Heartbreak Hotel, Blue Suede Shoes, Hound Dog, Love Me Tender, All Shook Up, Jailhouse Rock, One Night, It’s Now or Never, Are you Lonesome Tonight?, Can’t Help Falling in Love, In The Ghetto, Suspicious Minds, American Trilogy, Just Can’t Help Believing to name but a few. Elvis Presley is highly regarded as one of the most significant cultural icons of the 20th century, having starred in more than 30 films, performed record breaking shows and concerts and is the biggest selling artist of all time with over one billion records globally, it’s no wonder he was referred to as the King of Rock ‘n’ Roll. Among his many awards and accolades Elvis was nominated for 14 Grammy’s and aged just 36 was awarded the Grammy Lifetime Achievement Award. Elvis Presley was an icon and heartthrob the world over, still enjoyed by millions today his legacy lives on. This musical relives the incredible comeback and resurgence in his popularity and the monumental Vegas concert that confirmed Elvis’ legendary title as The King. This production celebrates 50 years since the TV phenomenon and is testament that his songs live on and the King still rules! 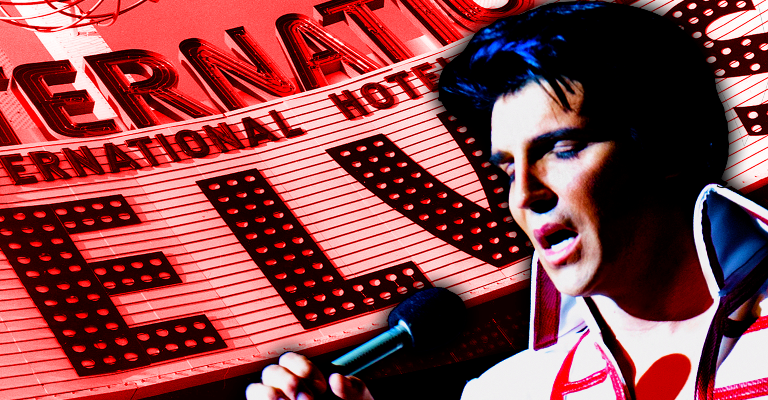 Don’t miss your chance to catch this electrifying musical before Elvis has left the building!